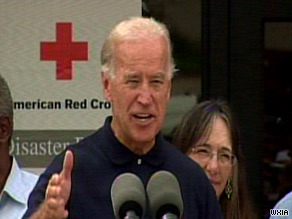 ATLANTA, Georgia (CNN) -- Georgia's flooding may pale to the devastation wrought by Hurricane Katrina, but the impact of the state's torrential rains on individual Georgians is comparable, Vice President Joe Biden said Friday. Vice President Joe Biden tells Georgians on Friday there will be no "stalling and shuffling" in the recovery process. Putting political differences aside, Biden appeared alongside congressmen and federal officials at a brief news conference in Marietta, an Atlanta suburb where the American Red Cross had set up a shelter at a civic center. "The truth of the matter is, for someone who lost their home, it is Katrina," Biden said. "We don't want anything like the past to happen again." Obama, who is at the Group of 20 summit in Pittsburgh, Pennsylvania, insisted Biden travel to the area, the vice president said. The storms, which dumped 22 inches of rain on parts of metro Atlanta, killed at least nine people in Georgia, and, according to the state insurance commissioner, caused about $250 million in damages. The federal aid, which will supplement local and state money, can be used for temporary housing and home repairs, low-cost loans to cover uninsured property losses and other recovery programs for individuals and businesses. Call 1-800-621-FEMA or visit www.fema.gov for information on disaster assistance or to register for federal aid. There will no "bureaucratic stalling and shuffling" as the federal government deals first with emergencies before making longer-term assessments of personal losses as well as damage to the communities' infrastructure, he said. "We're going to have people come see you," he said. "This is not going to happen overnight. This is not going to happen tomorrow, but it's going to happen." Homeland Security Secretary Janet Napolitano said the federal government will provide rental, housing and small business assistance. Craig Fugate, the Federal Emergency Management Agency administrator, vowed to rebuild the damaged communities with future hazard mitigation in mind -- "so next time there's a flood, it doesn't get damaged." Biden, who before speaking doled out hugs to disaster victims and posed for personal pictures, stayed at the Cobb County Civic Center well past the time allotted on his itinerary. Sens. Johnny Isakson and Saxby Chambliss, both Georgia Republicans, applauded the White House's quick response to their calls for aid. Isakson further thanked Biden for spending extra time consoling victims present at the civic center. "Out of every disaster, we have the opportunity for something good to come about," Chambliss said. "Out of this, we're going to become a stronger community." Rep. David Scott, D-Georgia, said six of the nine fatalities came in his congressional district, the 13th. He offered prayers and sympathies to the victims' families and echoed his counterparts' calls for prompt assistance. "Our sleeves are rolled up. We're in this with you," Scott said. Biden, federal officials and legislators applauded the American Red Cross, Salvation Army, emergency responders, state officials and volunteers who reacted swiftly to mitigate the flood damage. The vice president also lauded the victims and other members of the affected areas who banded together to help each other out. "Communities like yours may have lost a lot of the physical structure, but it looks to me you've kept a lot of the grit and determination," Biden said.